Give individuals in your group their own Hop-On Hop-Off Tickets to use at their leisure! 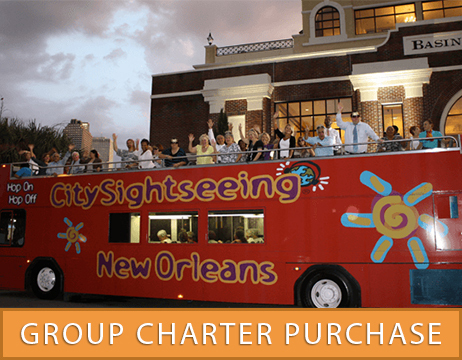 Our Open-Top Double-Deckers provide you with the only birds-eye-view of New Orleans – while you experience the most exciting and educational tour of our city. 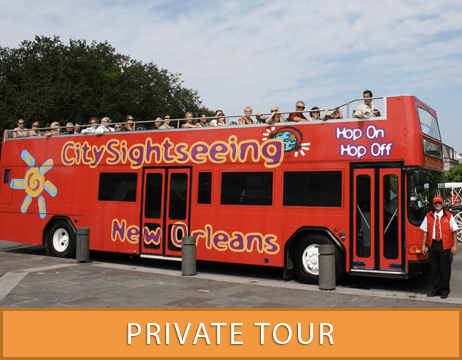 Hop-On Hop-Off is the most convenient city tour that provides continuous fun transportation between French Quarter and Garden District. Our experienced and locally licensed Tour Guides on every bus will take you through the history and legends; plus, you’ll hear all about the best ways to spend your time! Group rates are available for pre-purchasing parties of Adults (ages 13 and up). All seats are on our regularly scheduled, per-capita tours and seats are on a first-come first-serve basis. Group Tickets are not a private tour – No guarantee that your group will be able to Hop-On together. Payment required in full 7 days prior to service / Paid by check or credit card. Please complete and submit the form below for a custom quote with the best available rates for your group. You can expect a response from our Sales Office within 2 business days.